Developed by The Coalition, published by Microsoft Studios. 1-2 player campaign, 1-5 players online coop, 2-10 players online versus. 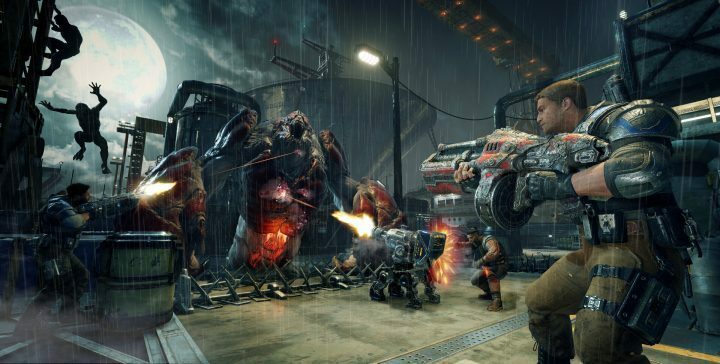 Gears 4 is the first game in the series not originally developed by Epic Games. 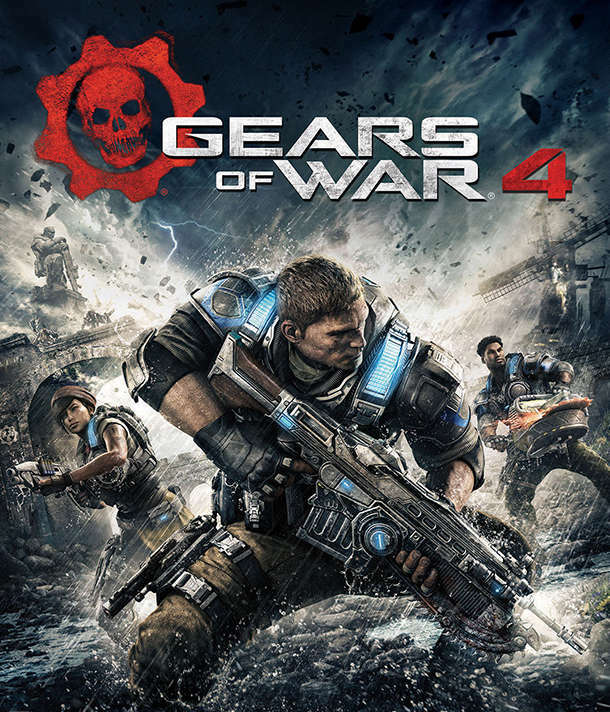 The Coalition proved they were technically competent with the Ultimate Edition remake of the first Gears of War, but with this new title they also prove they can make a full, original game that honours the series' legacy while creating new characters in a new story and adding new features. The good news is that this is an excellent Gears of War game and a worthy successor to Gears 3 that is quality enough to erase the negativity created by GOW Judgment. 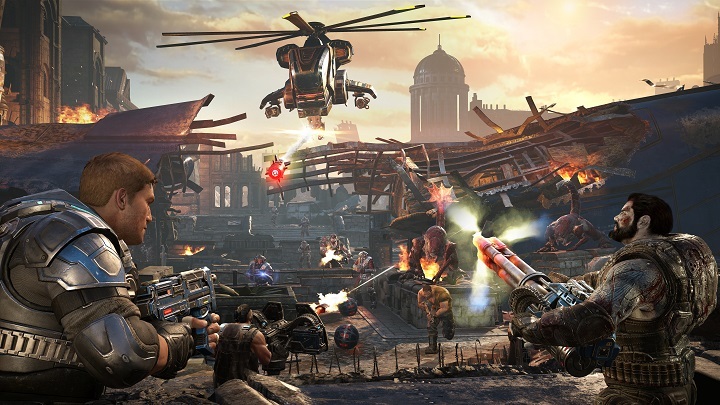 The bad news is that there isn't actually much "new" here besides micro-transactions that replace traditional unlocks, and if you never cared for Gears' heavy-feeling, third-person rolling-and-shooting action, there is nothing for you here. The story is set 25 years after the "Imulsion Countermeasure" event that wiped out the Locust and Lambent, effectively ending the conflict on Sera that had been the driving narrative behind all previous Gears games. Now a new generation runs the Coalition of Ordered Governments, aka the COG, and their rule has become heavy-handed in the absence of an enemy. The campaign begins with a prologue that showcases significant moments from past conflicts, including stealing the Hammer of Dawn from the UIR, a battle during E-day when the Locust horde first emerges, and defending Anvil Gate fortress from a huge army of Locust and Lambent until Marcus Fenix and company stop the Locust queen and deploy the Imulsion Countermeasure which served as the ending of Gears 3. This prologue is quick and fun, and does a great job serving as a tutorial, introducing controls and gameplay mechanics while catching players up on the story and setting the stage for what's to come. In rebuilding humanity, many have chosen to make a life outside of the sterile, structured COG cities, including protagonist James Dominic Fenix who is the son of Marcus Fenix & Anya Stroud. At the opening of Act 1, JD and his friend Del have abandoned the COG army to live as Outsiders. They are joined by Kait, the daughter of the Outsiders' leader, and her uncle Oscar. The game proper starts by tasking you (and optionally a second player) with sneaking in to a COG facility to steal a Fabricator for your village. You are confronted by one of the game's new enemy factions -- autonomous robots called DeeBees that initially act as peacekeepers but quickly become lethal threats as the conflict escalates. As you make your way through the first couple acts, you find out that people have inexplicably gone missing from both the COG cities and Outsider camps, and after re-uniting with your neanderthal father Marcus you confront the second enemy faction and Gears 4's true threat: the Swarm. The rest of the campaign has you chasing after Kait's mother Reyna and working to discover the source of the rising Swarm threat. Both the DeeBee and Swarm factions have units that are practically 1-for-1 analogs to former Locust units, but they exhibit differences in weapons and tactics. The DB robots use new SMGs, railguns, missile launchers and double-firing shotguns, along with area-of-effect shock grenades, to pin you down and slowly advance in force. The Swarm monsters use classic Gears weapons like Hammerbursts, Gnashers, Torque Bows and Boomshots to fight you cover-to-cover at medium range while smaller Juveniles attack up close en masse and Scions stay to the rear, wielding new heavy weapons, the Buzzkill and Dropshot, and buffing Drones. Combining new mini-bosses and great setpiece & action moments with a more intimate, focused feel, Gears 4's campaign feels closer to the original game's scope and tone, rather than the more epic-but-popcorn-y feel of Gears 2 and 3. There is heavy reliance on old characters and series staples, but the new characters and weapons have enough presence to create fresh interest and suggest a good future for the series. Production values are high -- Kait is voiced by Laura Bailey, Oscar is voiced by Jimmy Smits, and John DiMaggio returns as the eloquent meathead Marcus Fenix. Towards the end of the campaign a few more old favourites show up, and thanks to the great visuals, consistently good audio and solid, proven mechanics, the game is a pleasure to play. 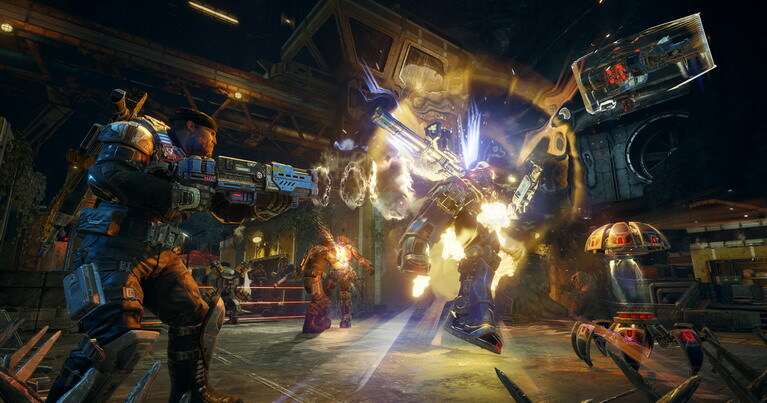 The triple threat of a Gears game includes cooperative Horde mode and competitive Versus modes online in addition to the campaign, and Gears 4 offers the most ways to play yet. A strange feature of the online Versus is that the unranked "Social" mode has rolling lobbies and map votes but you can't choose which mode you want for matchmaking. If you want to stick to King of the Hill or Team Deathmatch, you have to choose a "Core" playlist, all of which are ranked. There are numerous other modes, including the new "Dodgeball" which lets you bring back defeated teammates with each enemy kill. 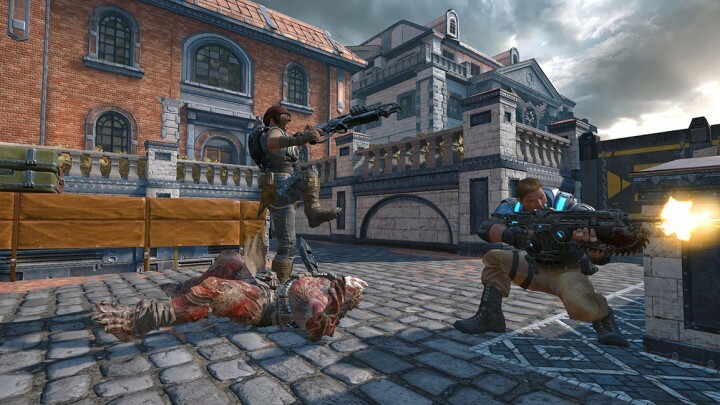 To cater to the growing competitive & eSports crowds, Gears 4 offers Escalation and Execution modes with re-tuned weapon attributes. A nice new addition to Versus is being able to play cooperatively with 4 other matchmade players against a team of 5 bots with selectable difficulty. This is great for learning the new weapons and CQC mechanics like the yank-and-shank, and also allows folks to avoid the worse parts of the highly competitive and sometimes toxic online community. This also gives another place to complete bounties and earn credits without pressure. Horde mode is back as version 3.0 and is more complex than ever. You now choose a character's class which involves 1-5 skills you set, and fortifications like razor wire barriers and gun turrets can be placed anywhere. This mode is played with up to 4 other players and can be on any map. Currently matchmaking only places you in fresh Horde lobbies starting at wave 1 and new players have to be manually invited if someone drops, but the developers have already said that backfilling will be added in an upcoming patch. So far all of this has been fairly standard progression from what was offered in Gears 3 and Judgment, but the major new addition to Gears 4 is the economy system. Everything you do in multiplayer revolves around cards -- in Horde mode, cards determine what skills your class has, and both Horde and Versus use bounty cards that reward completing specific tasks with bonus XP or credits. These credits are used to purchase new card packs, which also provide new character and weapon skins in addition to emblems, skills and bounties. Cards you don't want can be broken down to scrap, which you then use to craft cards you do want. Unfortunately, crafting anything other than Common cards requires a large amount of scrap -- a Common card will only provide 5 scrap, and crafting a Legendary character or weapon skin will cost 2,400. You can also buy card packs with real money. This has rubbed a lot of players the wrong way, but the upside of this new micro-transaction model is that future maps and other DLC will be released free-of-charge. The issue I have here is that most of the card packs are just way too expensive. The "Elite Pack", which offers the best chance of getting rare characters and weapon skins, costs 3500 credits or $4.99 for a single pack, which is only 5 cards and only guarantees 1 rare or better. The good thing is that everything can be earned in-game without spending any real money, and the developers have already increased the credits earned for all online modes. While skill cards do affect your abilities in cooperative Horde mode, everything you can earn or buy for Versus modes is 100% cosmetic, so there is no "pay2win" and someone who spends hundreds of dollars won't have any advantage over peasants like me, except that they might collect all of the Day of the Dead-themed skins faster than I do. + Excellent visual and audio design; Gears' world now has COLOR! Overall I give Gears of War 4 a 9 out of 10. It loses 1 point because it relies a lot on old stuff, and is too stingy with card packs. It is a very well-made game with high production values and excellent multiplayer options. It is a good value with a 8-12 hour campaign (depending on chosen difficulty) and tons of replayability thanks to robust cooperative and competitive modes. The developers have already made several small changes through their back end, and have shown diligence in addressing concerns from the community. Achievements: Unfortunately Gears 4 is pretty stingy with its Achievements and Gamerscore. Playing through the campaign and getting most of the collectibles will only net you about 200G. 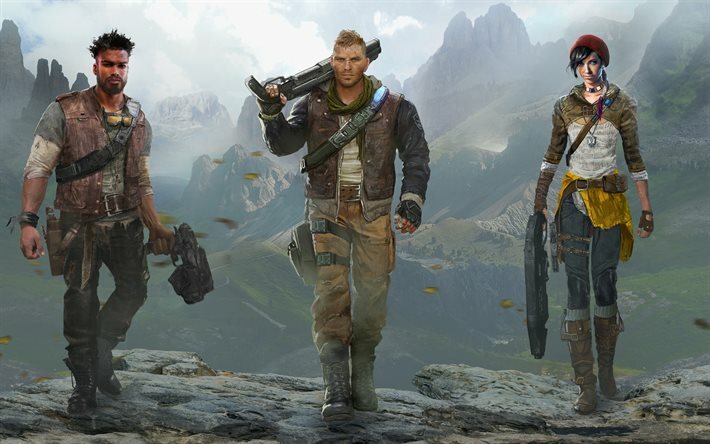 If you're going for a completion, among other things it will require earning Seriously 4.0 which includes completing the campaign on Insane, re-uping [prestiging] 10 times, getting all Horde classes to level 10, finishing Horde to wave 50 on Insane once with each class, and finishing 50 waves on all 10 of the launch maps. I agree. I'm really enjoying this game. Storywise I think they actually incorporated a new generation of gears pretty good. They managed to create enjoyable characters and a good ending for what it implies. Multiplayer is Gears at its best. Lots of modes and the inclusion of "VS CO-OP" it's great for beginners that feel anxiety on jumping online in ranked matches. Horde is doable on Insane difficulty if you have a decent team of balanced classes; one scout, one engineer and the rest is optional. If nobody knows how classes work then it turns into a fuckfest with everybody trying to pickup energy all over the place and getting killed on secluded parts of the map. There's no pay-to-win. All microtransactions are for skins, emblems, XP boosts and credit boosts. Recent changes on how you win credits have made purchasing this "crates" more accessible. Finally, I got this with the Xbox One S console, which looks better in real life than what you see in pictures. And those 2TB of hard drive are bliss. PS: Those zombie skins look awesome, but after a few rounds, hearing BRAIIIINNNNSS over and over again will drive you mad. I wish it was mixed with some zombie grunting or something else. Ok so we finished the campaign today- it felt short. Too short- and I know it's probably so they can fit everything else on the disc, but still- it was less than 6 hours to run through it in the easiest difficulty with Evol (and I don't agree with games ramping up difficulty just to pad their game length lol). Also, as I played, in my head I kept making Force Awakens comparisons. Kat, did you guys play split-screen or on separate Boners? Have you tried Horde mode or versus co-op yet? Split screen. We ain't got 2 boners- who's that rich? Haven't tried any other mode yet.